Magnalite Classic 15-Inch Oval Covered Roaster. Includes 1-Each Magnalite Classic 15-Inch Oval Covered Roaster. 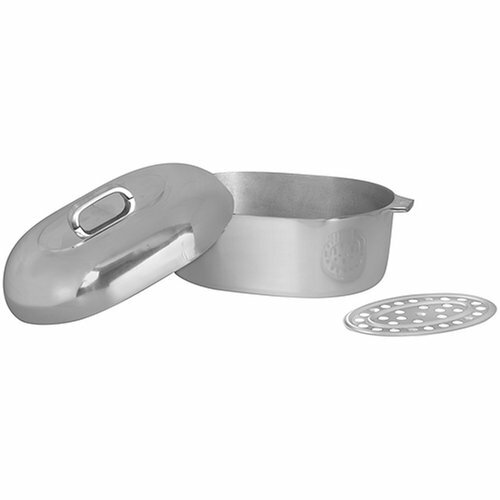 Magnalite cookware feature vessels and lids constructed from hand-poured cast aluminum. The vessels feature a thick base that won't warp. Heavy domed lids lock-in moisture, transfer heat from the vessel side wall, and help facilitate convection style heating. Features phenolic handles and lids which are oven safe to 350 degrees. Line has earned a loyal user base who appreciates its uniquely even heating. If you have any questions about this product by Magnalite, contact us by completing and submitting the form below. If you are looking for a specif part number, please include it with your message.